Laci Peterson was about seven months pregnant when she and her unborn son were killed. This tragedy has been given the kind of media coverage usually reserved for wars and rumors of war. But why? Why has almost everyone in America heard of Laci Peterson? Peterson's murder was surely a tragedy and an outrage to those who knew her. Most Americans, though, didn't know her, and wouldn't have known her from any other pretty woman before she was killed. Being murdered made Laci Peterson a star. The case was covered in great detail even on Entertainment Tonight, Access Hollywood, and other TV shows dedicated to coverage of the entertainment industry. 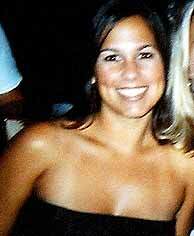 The dead woman was not an entertainer, though, and neither was her husband and accused killer, Scott Peterson. She was a substitute school teacher. He was a fertilizer salesman. She was born Laci Rocha, and raised on a farm. Her father ran a tractor rental business, but divorced her mother when Laci was very young. Her mother eventually remarried, and her stepfather is a dairy farmer. As a girl, Laci was "always smiling and bubbly and talkative ... usually the center of attention," said a childhood friend. She was a cheerleader in high school, and majored in horticulture at California Polytechnic Institute in San Luis Obispo. She met Scott Peterson, a fellow student at Cal-Poly who worked as a waiter, when he took her order at a cafe. Laci asked a friend to give Peterson her phone number; they began dating, and lived together until after Laci's graduation, when they were married. Together they ran a successful restaurant in San Luis Obispo, but eventually sold it to return to their shared home town of Modesto. They bought a small, affordable house, and seemed to be happily married, expecting their first child. According to her mother-in-law, Jacqueline Peterson, Laci had talked about how well things seemed to be going, just before she disappeared. "We said a little prayer of thanks," she recalled, "and we're not even heavy prayer people. All our kids are healthy, no divorces. I remember saying how lucky we are, how blessed we are." On December 24, 2002, Laci was reported missing. Her body was found in San Francisco Bay more than three months later, along with her fetus, which had been ejected at some point following death. Thanks to endless media coverage, Laci Peterson has become one of the most famous dead women of our time, alongside Mother Teresa and Lady Diana. Numerous books and videos have been released, exploring and theorizing what happened to Peterson. Dean Cain played her husband in the 2004 TV movie, The Perfect Husband: The Laci Peterson Story. The case has fueled America's endless abortion controversy. The question of whether Scott Peterson could be charged for murdering his unborn child, and whether the baby was born alive, led Congress to pass the Unborn Victims of Violence Act (also called "Laci and Conner's Law"). Of course, abortion notwithstanding, harming a fetus had long been classified as a crime, and the main accomplishment of this new law is to define a killed fetus as "human". But even that connection to a public issue has only been tangential, often not mentioned at all in the coverage of this matter. It doesn't explain Laci Peterson's posthumous fame. More than 20,000 people are murdered in America every year, and every one is a tragedy and an outrage to the victim's loved ones. Entertainment Tonight, though, doesn't usually send a reporter and camera crew. When Peterson's rotting corpse was first found, comedian Bill Maher cracked on HBO, "Laci Peterson's body was discovered this week. I've heard of breaking up with someone before Christmas so you don't have to buy a present, but that's harsh." When the audience didn't laugh, Maher asked, "Oh, I can attack the president, the economy, the war, but don't mess with Laci Peterson?"